In 2016, as the cannabis industry began to take off in many states, the FDA found that only two of 24 CBD products contained the amount of CBD that the labels claimed. Sellers were unaware of what they were peddling and consumers did not know what they were buying. For this reason, CBD testing is necessary to determine the potency, efficiency, safety, and lawfulness of cannabis products, whether medical or recreational. Modern cannabis laboratories can measure beneficial constituents like cannabinoids and terpenes, as well as deleterious contaminants like pesticides, mold, and residual solvents. Cannabinoids like CBD, THC, and CBG are diverse, organic chemical components. Like terpenes, they interact with receptors in the human body to alter neurotransmitter release in the brain, producing many of the mental and physical effects. CBD – Cannabidiol is a non-psychoactive compound that counteracts THC side effects, in addition to reducing PTSD anxiety, chronic pain, insomnia, blood pressure, inflammation, epileptic seizures, and MS symptoms. CBDA – Cannabidolic Acid (CBDA) is a non-psychoactive cannabinoid that shows promise in treating seizures, nausea, pain, inflammation, and cancer. CBDV – Cannabidivarin (CBDV) is a non-psychoactive cannabinoid that does not produce a euphoric” high,” but can be used to treat seizures, Crohn’s disease, HIV, AIDs, multiple sclerosis, mood disorders, nausea, pain, and inflammation. Our Florida testing lab can test all products with batch level testing or test individual products.From our reports, you’ll be able to determine the spectrum of a product by observing the presence of particular cannabinoids and the potency of the product by observing the concentration of cannabinoids. What do high CBD or low CBD cannabis test results mean? High-CBD/low-THC strains – deliver clear-headed treatment for inflammation, anxiety, and seizures. Some consumers are particularly sensitive to anxiety, paranoia, and dizziness, so CBD becomes a crucial component of successful treatment. Equally balanced CBD/THC levels – offer more of the mental euphoria associated with THC and less of the memory deficits seen in people taking high THC cannabis. Low CBD/high-THC strains – provide patients with greater relaxation, help sleeping, and relief from debilitating chronic pain. Modern Canna Science offers consulting services to help you efficiently cultivate the type of product you desire. What other tests does Modern Canna Science offer? In addition to CBD testing, we can also assess your samples for other quality and potency-related compounds (such as CBC, CBG, THC, THCA, THCV, and terpenes), and for undesirable components (such as pesticides, mycotoxins, heavy metals, and residual solvents). How does a Florida testing lab examine cannabinoids? There are a variety of methods to measure CBD concentrations. The “gold standard” technique is called High Performance Liquid Chromatography (HPLC). In this scientific procedure, a sample collected from your cannabis flower is mixed with ethanol and pumped at high pressure through a tube that contains molecule-attracting material that causes certain compounds to move slower toward the detector at the end of the column. Different cannabinoids like THC and CBD travel at different speeds, allowing for the characterization of the sample. Another method we may use, particularly for terpene testing, is Gas Chromatography. Lab analysts apply heat to the sample to cause acidic cannabinoids and pesticides to change structure, making them undetectable. Therefore, the amount of neutral cannabinoids and terpenes are visible within the sample. How long does it take to get the results from CBD testing? Cannabinoid testing from Modern Canna Science will cover multiple variables, including potency, microbial, pesticide, and terpene presence. Turnaround times range from three business days to two weeks. 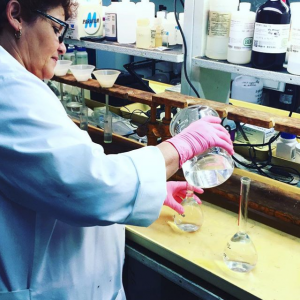 Why is working with a Florida testing laboratory important? Producing a valuable third-party opinion from a trustworthy, independent source. Working with a lab that has 50 years of quality assurance testing experience. Supporting a minority-owned business like the University of Florida and Confident Cannabis. Committed to consumer confidence, transparency, and high standards of production. Getting a more accurate picture of the plants you are cultivating. Staying one step ahead of regulations and improving the credibility of the entire industry. Contact Modern Canna Science for more information on CBD testing and quality assurance.